Does the Jack Ranch have hogs? You bet, just take a look at the pictures below. The Jack Ranch is a new hunting opportunity for hunters in California. The Jack Ranch is 85,000 acres, located in Central California. It is a 30-minute drive east of Paso Robles or 30 minutes west of Kettleman City. Hunting on the ranch just started in the last couple of months. Guide, Darby Neil, reports that his hunters usually have their hogs by 10 a.m. 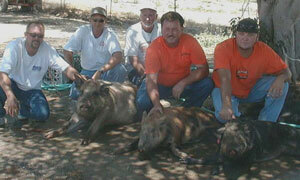 This past week five hunters took six hogs on a one-day hunt and were all back in their trucks by midmorning. After hunters take their hogs, they are field-dressed and taken to a cooler. Butchering service is available or hunters can take their game to their favorite butcher shop. 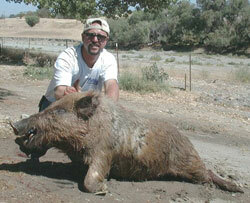 Cost of Jack Ranch one-day hunts are $450 for a meat hog or $550 for a trophy hog (2-inch tusks or better). 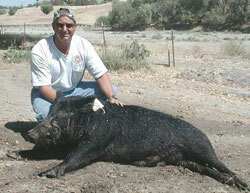 Hunters can take a second hog for an additional $150  best of all, this hog can be a meat hog or a trophy hog. If you are interested in booking a hunt or just getting more information contact Darby Neil at (805) 772-1222 ext. 11 or Bert Claassen at (805) 467-3262. Tell them you read about their hunts at WesternHunter.com. Remember to take your camera on your hunts and send those pictures to us so we can share your hunting memories with other readers of WesternHunter.com. Guide Darby Neil says, "It's not a matter of getting a hog but getting the one you want." The hunter above passed on 30 good hogs before firing a shot. He then took another meat hog after lunch because he missed his trophy boar. 2 5/8 inches. 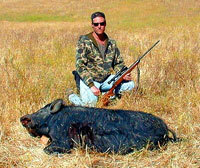 Eric shot the boar on a downhill run at 150 yards with his Remington 7mm mag. Eric was guided by Darby Neil. This group of five happy hunters is from Cash Grading Inc. They are showing off three meat hogs of the six hogs they took on a morning hunt. Jeff Arnet (far right) took one more meat hog on the evening hunt while looking for a trophy. Guides Darby Neil and Mark Tognazinni split the group and put them on either side of a large group of hogs for a shoot they will not forget. The hogs were caught in a downhill crossfire and didn't know which way to go. It wasn't a matter of getting a hog but getting exactly the one(s) you wanted. That is usually how it goes on the Jack Ranch. Left to right Eric Dunham, John Mitzel, Paul Hergistad, Tim Cash, and Jeff Arnet. John Mitzel with his first big boar. He took it with a 30.06 at 30 yards.